We’re not done celebrating Mickey Mouse’s 90th anniversary just yet. Kicking the festivities up a notch is the show that always delights the whole family: Disney On Ice! 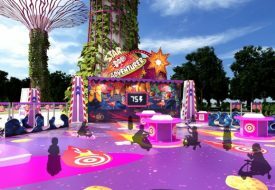 This March school holidays, from 20 to 24 March, the popular ice show is skating into the Singapore Indoor Stadium for a special commemorative edition. 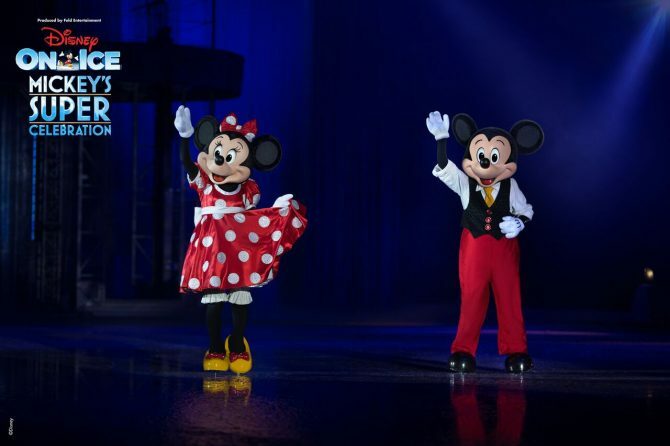 Disney On Ice presents Mickey’s Super Celebration brings decades of magical Disney moments together in one spectacular show. 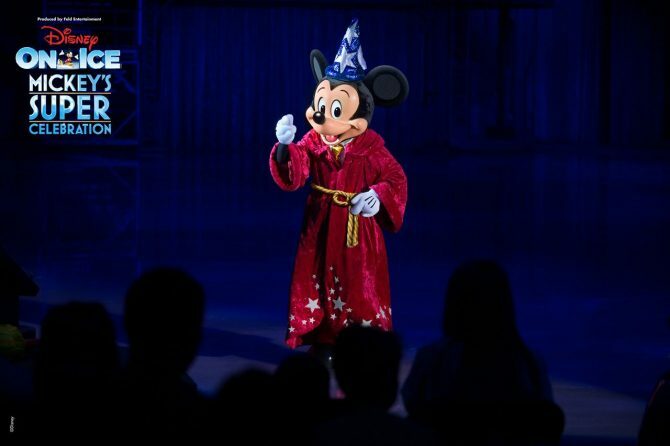 More interactive than ever before, the show will quite literally invite you to join Mickey and Friends as they journey back in time to treasured memories in Disney’s long legacy. Adults, get ready to be hit by a wave of nostalgia as you relive the evolution of Mickey Mouse from the original Steamboat Willie to the magical Fantasia, go on adventures with the Toy Story gang, and dive into the ocean with Nemo and Dory. All generations, young and old, will be dazzled and inspired by the stories of the Disney Princesses. 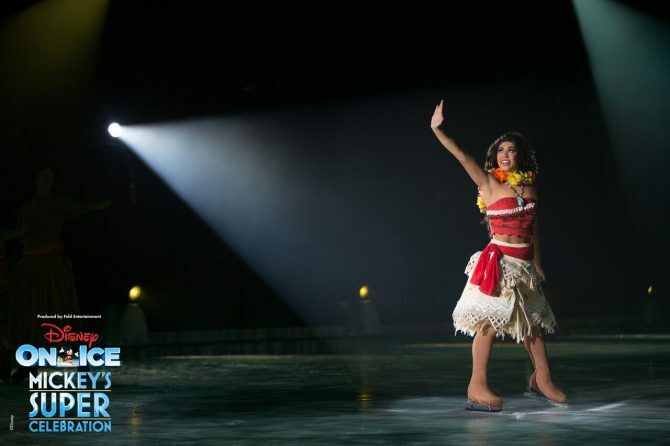 They include Frozen sisters Anna and Elsa, who’d surely look at home on the ice, as well as Moana, trading sea for ice for the first time in Asia. 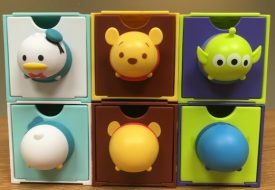 Also making their Disney On Ice debut in Asia are the Inside Out gang of Emotions: Joy, Sadness, Anger, Fear and Disgust. With such a packed program, there’s so much to look forward to! What are the people behind the show most excited about? 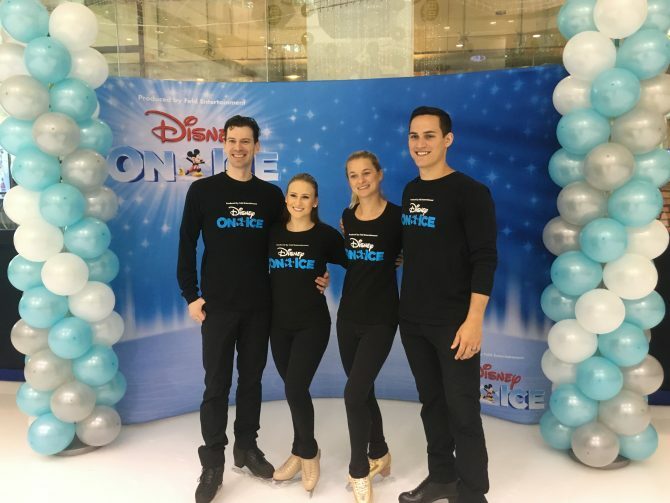 After a fun skating masterclass with four principal skaters of Disney On Ice presents Mickey’s Super Celebration, we sat down with Hollie Marron, the show’s tour coordinator, and her skater husband Grant Marron, who portrays the character of Shang from Mulan. 1. 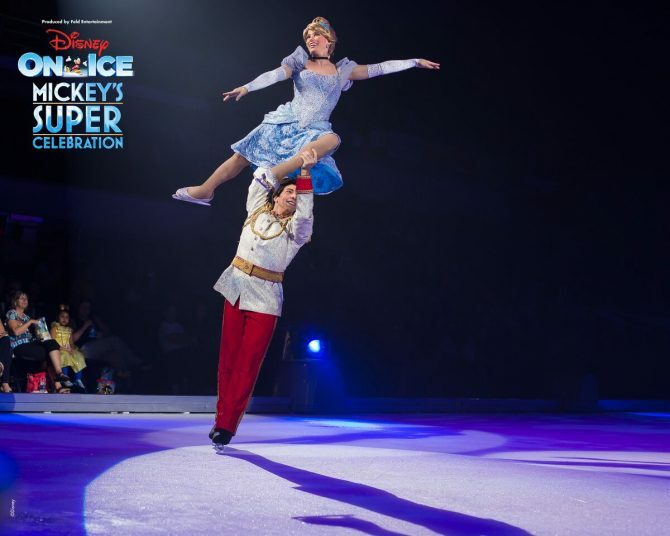 How is this special commemorative show different from the previous Disney On Ice shows? Hollie Marron: This show is very different from any other show you’ve seen before from Disney on Ice. It has so many interactive elements, it’s just too many to mention, but we have live hosts – we have two performers that are in the audience throughout the show. They’re walking in and among you, they’re asking you questions. We have mouse pads that are connected to our large screen above the ice. At the beginning of the show, if you are loud enough and you scream loud enough, you can actually start the show by pressing one of the live host mouse pads, and turning on all our lights and sounds. So it’s really amazing. 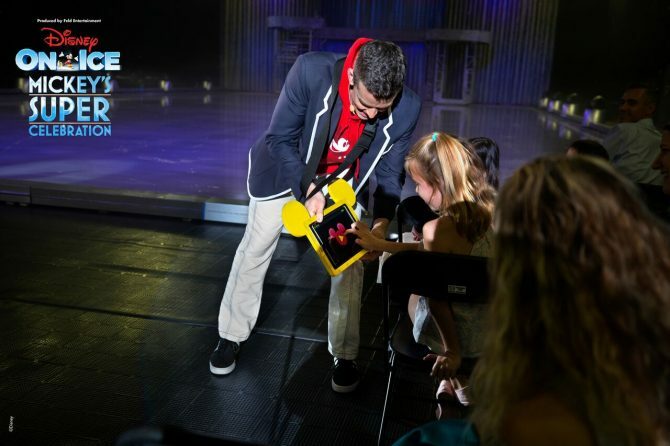 One of my favourite things to do at the top of the show is to come out and see the kids react to the live hosts. You come in to be part of the show and I think that makes better memories and really makes it stand out from any show you’ve ever seen. Grant Marron: I’ve been on the road touring for about 10 years now, I’ve been on a number of different shows, and this is a very, very unique show. We have so many different elements and there’s something for everyone. We have live hosts, we have interactive dancers. In “Woody’s Round-Up,” Woody and the gang come out and teaches the audience an entire dance and we’ll do it altogether. And then we have two of the more modern stories, including Moana for the first time in Asia. So that’s really exciting. 2. There are so many audience participation elements. I read that one of them is the audience getting to vote on what costumes Mickey and Minnie wear for the finale. Hollie Marron: Yes, in the second half we’re going to put up three different costumes on our big screen and on our mouse pad, and we want you guys to cheer for which costume you think Mickey and Minnie should wear in the finale. And it doesn’t matter which one you pick, we’re gonna make sure Mickey and Minnie have that on in finale. We have a running joke at the moment because Costume 3 seems to be the most popular. Each of them are different styles, Mickey and Minnie have so many different personalities, it’s so great to see the costumes reflect that. My personal favourite is Costume 2. I’d like to see Costume 2 win, so I’m gonna just put that out there. I want you guys to all come to the show and really pick which one you’re gonna want to see in the finale by screaming nice and loud. 3. 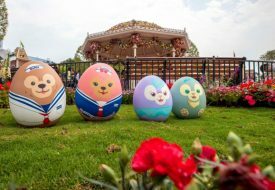 This special program brings together a range of Disney characters and films, from older and classic ones to the more contemporary ones. Is there a running storyline or theme connecting all of them? Hollie Marron: Yes, the theme this year is Mickey’s 90th anniversary. We’re celebrating 90 years of Mickey Mouse. We start from the top of the show with Steamboat Willie, we go through classics like Fantasia with the brooms, and we go right up to modern day with Moana and Frozen. So there’s really something for the grandparents, the parents, the children… there’s something from Mickey’s memories that everyone’s going to love. The way we link it together is Mickey is going to be searching for his favourite memory. So it’s really good to see families together, young and old, and they all have something in the show that they remember from their childhood that they’re gonna pass on to their kids and create even more family memories. 4. What is your personal favourite segment? Hollie Marron: That’s a really tough question because there’s so many parts of the show that I love. I think one of the parts I would say I come out from backstage to watch the most is probably the “Princess Power” segment. We have about nine princesses on the ice at one time, everyone from Snow White and Cinderella to Tiana to Rapunzel and Ariel. And they’re all out on the ice and they’re skating together, showing off the attributes of strength, of determination, of bravery, of courage… I think that’s a really important lesson to teach young girls today, so seeing all these young talented women out there skating, I think is really inspiring. It makes me cry every time. It’s a really strong number. Grant Marron: “Princess Power” is one of my favourites, too. My specific favourite number is “Brooms,” because I think it’s a lot of fun. It’s a precision number so we’ve got a lot of different skaters on the ice and they’re doing a bunch of different formations, splicing and things like that, and it’s set to the Sorcerer’s Apprentice from Disney’s Fantasia. So we’ve got Mickey out there with all his brooms and he’s trying to control them. It’s a really fun number and it’s all done in glowing black lights. 5. Grant, I’ve always been curious: Do you get to choose the character you play? Grant Marron: Usually I don’t get to choose my character. Over the course of my career, I’ve played several different characters – everything from Jack Skellington to Prince Eric to Flynn Rider. This year I’m portraying the role of Captain Li Shang from Disney’s Mulan. So that’s my role this year and it’s a lot of fun because I get to be in the “Princess Power” segment. Each of the princess has their own story, they do their own solo, and at the end they all skate together. 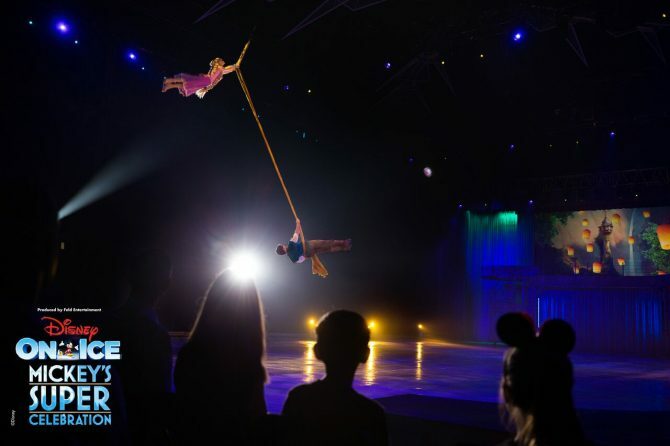 And in that section, we have to aerial acts where we’ve got Ariel up on a Spanish web, which is a rope that hangs about 10 metres up in the air, and then we’ve got Rapunzel flying on some aerial silks that’s about that same height, both her and Flynn do an entire dazzling routine up in the air above the audience. 6. Will there be many cool and complicated tricks in the show, like axel or quad jumps? Grant Marron: We do have several double axels in the show. We’ve got one in the opening, my partner who portrays the role of Mulan does one at the top of her number, and then we’ve got a couple of triples in the show. We do have world-class athletes and then we have some things that are very show-specific and you won’t see in competition that only show skaters can do, like the lift you saw Will and Adriene do (they portray the roles of Aladdin and Jasmine), it’s a show-specific lift that you won’t see on TV for competitions; you have to come to one of our ice shows to see it. 7. What do you like most about going on tour and performing with so many different countries? Grant Marron: I’ve been on the road for a very long time now and the thing I love is the audience reactions we get. I love staring out into the audience and seeing everyone happy, singing along. There’s a specific noise that every audience makes as soon as the lights go out and the show starts. It doesn’t matter what language they speak, it doesn’t matter what culture they’re from, it doesn’t matter what continent I’m on. Every audience makes the same noise, and it’s this gasp of excitement and exhilaration and when you’re backstage and you hear that noise, it really gets your heart racing and your blood pumping. It’s the best thing, and I have yet to meet an audience that doesn’t sing “Let It Go” with us. They all sing it out loud. 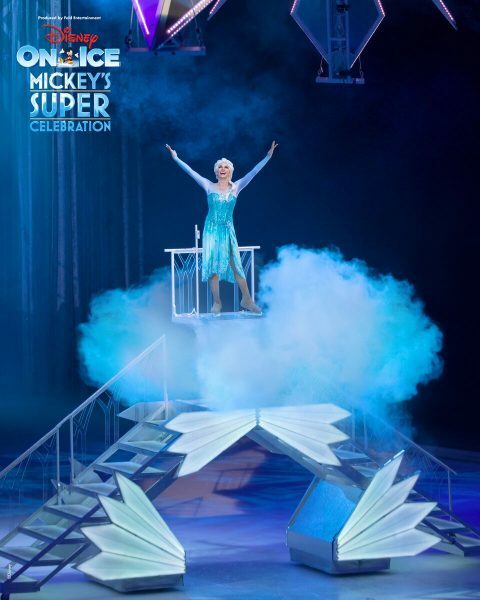 Get your tickets to Disney On Ice presents Mickey’s Super Celebration here!